EAST LIVERPOOL — The East Liverpool Dahlia and Floral Society will hold its 92nd — and final — show this Saturday. Due to several factors, including declining local membership, the final show is scheduled 1-4 p.m. Saturday, Sept. 30, in the Peter Metrovich Room of the St. Clair Township Administration Building, Pugh Road, Calcutta. Entries may be made that day until 10 a.m.
“If you want to grow a few dahlias in your garden or flower bed, dahlias are a very easy flower to grow and will provide bloom from mid-summer until frost. However, growing winning show dahlias is another matter, requiring a major expenditure of time and patience,” a release states. “In today’s world, fewer and fewer people can or will engage in such work. The numbers of growers and members has declined through the years. Interest in the shows has decreased and the number of society members in East Liverpool has gone down. The society was founded March 5, 1926, with four members. J.T. Watkin was elected president, Fred Smith as vice president, Thomas Anthony as secretary, and Harry Stoddard as treasurer. According to an early history written by Watkin, the society was founded “for civic pride, advancement of horticulture and the growing and displaying of dahlias.” At the first general meeting, 21 new members were enrolled and before the year concluded, the membership had grown to 38. The first show was held the third weekend in September in the D.M. Ogilvie and Co. department store. It has been held each year since, even during the depths of the Depression and the height of World War II. The honorable W.E. Wells, president of the Homer Laughlin China Co. and former West Virginia state legislature, provided tables for that first show. Wells was an ardent flower grower and for each of the 92 shows, Homer Laughlin China Co. and the Wells family have provided the top prize of the show in his memory. By the end of WWII, the society and its show had become a major part of the community. Records indicate the society had 350 members and, according to newspaper reports from that time, as many as 3,000 people attended the show. In those days, the society had musical programs on Sunday afternoon and even elected a queen. Meetings were held each month and Santa Claus made an appearance during Christmastime. For the 60th show, a reception was held in the Masonic Temple and Ohio Congressman Douglas Applegate presented the awards. Through the years, the show was held in many different places including St. Stephen’s Episcopal Church, Westgate school gymnasium, East Junior High gymnasium, the Municipal Auditorium, St. Aloysius School cafeteria (20 years), Masonic Temple (10 years), and for the last several years in the St. Clair Township administration building. East Liverpool Society is the oldest in Ohio and the eighth oldest in the country, and it has been recognized on the national level. The society hosted the Midwest Dahlia show in 1947, with headquarters in the Traveler’s Hotel and the show in the Municipal Auditorium. The 1989 show was held at the East Liverpool Motor Lodge and the society again hosted the show in 2004, at the Holiday Inn Metroplex in north Youngstown. 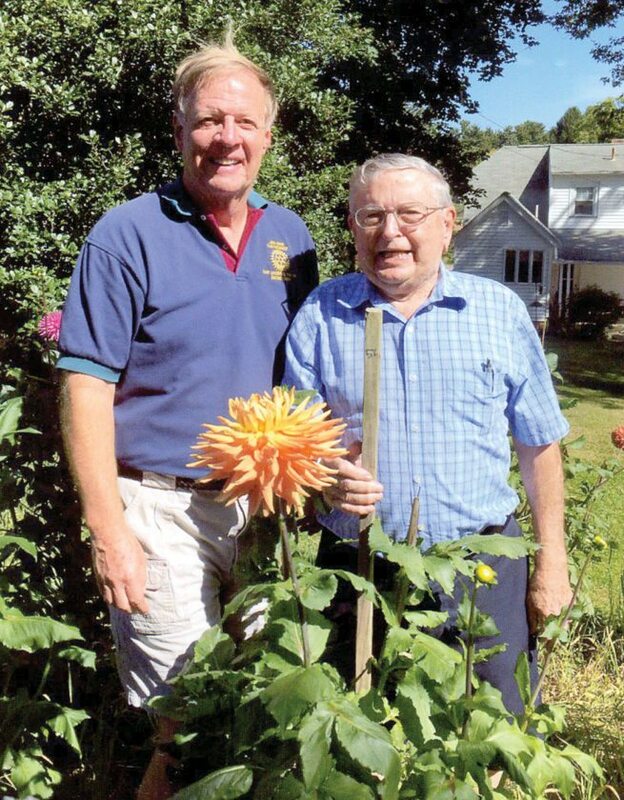 The dahlia is the world’s most variable flower and the American Dahlia Society has a complex procedure for certifying a new variety — the East Liverpool society has had many such introductions. The late Wm. S. Haugh led the way through the years with nearly 20 introductions (for years, he planted nearly 1,000 seedlings with no guarantee that any would be certified). His “Billy” originated in 1962, (a small yellow dahlia) lasted for 50 years, and was grown worldwide. Jack Eccleston introduced a number of winning dahlias, including one he named “Ceramic Beauty.” In recent years, Mike Parkes, Gene Toot, Warren Knopp, Jim Chuey, and Harriet Chandler have all introduced a new variety. For many years, growers from Pittsburgh, Cleveland and beyond have made their way to the East Liverpool show. East Liverpool is the smallest town in the United States to have had a dahlia show. The continued quality of the bloom here is shown in the fact that the grand champion at the last three national shows has been produced by growers in northeast Ohio who have long brought flowers to East Liverpool. The long time motto of the East Liverpool society, “When better blooms are grown, East Liverpool will show them,” continues to be true today.